The past couple of days have been slightly warm. If you call over 90 degrees "slightly warm." Personally, I’d call it "holy cow it’s boiling outside!" With a heat wave in progress, we’ll be looking for ways to stay cool this weekend. Trips to the playground are likely out. Instead, we’ll find some indoor activities to keep everyone cool and happy. If we do go outside, perhaps we’ll break out the pool and swimsuits. There’s nothing like splashing in the water to help you cool off. 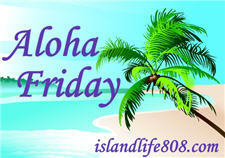 My Aloha Friday question for today is: How do you stay cool when it’s hot outside? I’m in the pool a lot! We installed it last year and are LOVING it! I have a pool and decent a/c. Woohoo! Harriet recently posted..What kind of death is worthy of spammers? I try not to move. If it gets too bad I go for a drive and blast the a/c! Becca recently posted..Aloha Friday #40 – I’m 29!